This elegant moss-covered egg garden topiary of roses and ivy topiary accents is a delightful topiary floral addition to any room. When considering all our rose topiaries, this topiary design showcases a distinctive, historical egg topiary shape. Our elegant egg and roses topiary is a graceful paragon of topiary design and variation of quintessential 16th - 17th century English garden topiary precision. 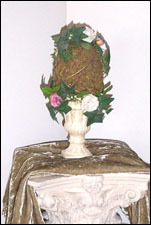 This topiary centerpiece boasts a sublime combination of natural moss, ivy topiary and rose topiary accents. Our chic egg topiary is established with lush green sheet moss and punctuated with silk roses and ivy sprouting from the base to the pinnacle of this mini topiary. This stunning variation of the egg garden topiary is perfected with gold wire accents woven throughout the topiary centerpiece, thus completing this artful faux topiary. Purchase a singular topiary centerpiece or more than one of our moss-covered egg and rose topiaries to impart a beautiful flower topiary design statement of grace and charm in any interior!